A couple weeks ago, I spoke about Topaz and how unsatisfying it was. 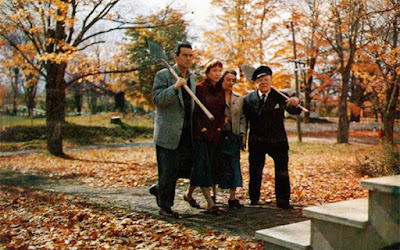 Today, I want to talk about a Hitchcock film that I love and lament the fact that this film wouldn’t be made today. 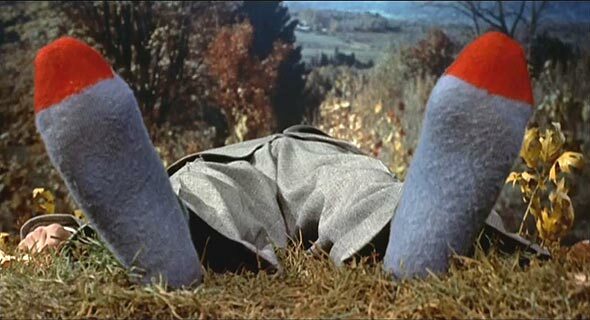 The film is The Trouble With Harry. What is the trouble with Harry? The trouble is that Harry’s dead. 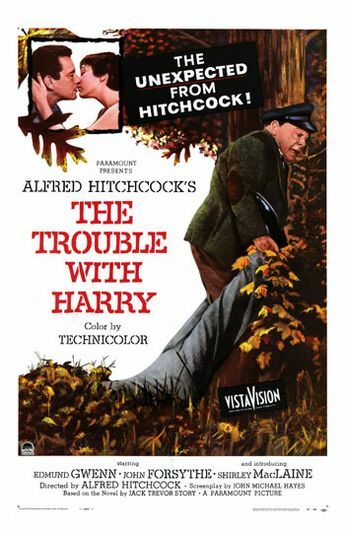 The Trouble With Harry was one of Hitchcock’s few genuine comedies and it was, sadly, a financial failure. It then disappeared for a while, but is now available and has quite a strong following. At its heart, this film is a romantic comedy that takes place against a sort of murder mystery where several characters believe they may have killed a man named Harry. The story takes place in Highwater, Vermont, and it begins with the discovery of a corpse on a hill top. The corpse is Harry, and it’s not clear who has killed him. In fact, three of the main characters each think they may have been the one who killed Harry. 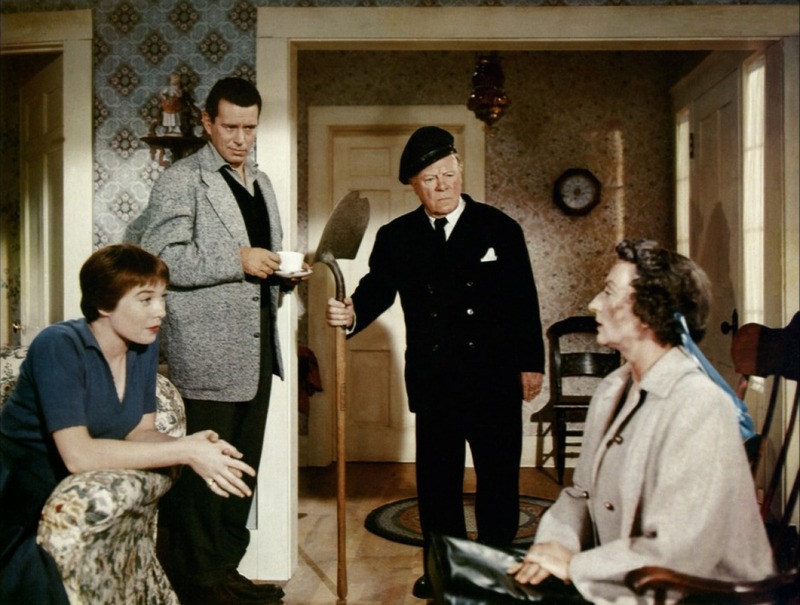 Retired sea Captain Wiles (Edmund Gwenn) thinks he shot Harry with his rifle when he shot at a rabbit and missed. Harry’s estranged wife Jennifer Rogers (Shirley MacLaine) thinks she killed Harry by hitting him with a milk bottle on the head after he showed up at her home. 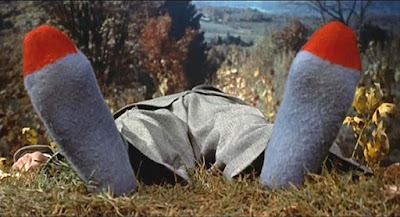 And retired naturalist Miss Gravely (Mildred Natwick) thinks she killed Harry by striking him with her hiking boot after he came at her while still groggy from the blow he received from the milk bottle. Bringing them all together is Sam Marlowe (John Forsythe), a proto-hipster artist. 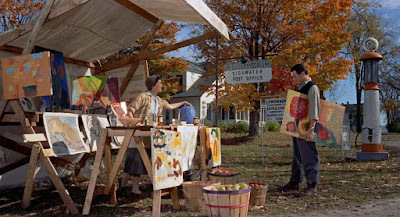 He is looking for something to paint when he stumbles upon these people trying to figure out what to do about the body. The problem is that none of them knows who actually killed Harry, and none of them knows what to do next – particularly as no one is going to miss Harry. 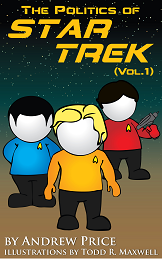 As they sort this out through a series of missteps, love blooms between a few of the characters. Meanwhile, they need to avoid Deputy Sheriff Calvin Wiggs (Royal Dano), who seems intent on finding some wrongdoing. So what makes this film so enjoyable? For one, it is a beautifully shot story that gives you a sense of how great Vermont can be when the leaves change. To me, this is a Fall movie, just like Something Wicked This Way Comes. For another, the actors are all fantastic in this. They have tremendous chemistry, which makes you want to spend time with them. For yet another, the film is exceedingly funny in a dry-wit sort of way. You won’t ever laugh out loud, but you will smile a lot and chuckle repeatedly. Indeed, the humor is quite subtle. The humor in The Trouble With Harry comes from the setup itself, which is quite funny, and the group’s missteps in handling the body. It also comes from the indifference with which they are treating the death. Mostly though, it comes from the quirkiness of the characters. What I like best though is the sensibility of this comedy. This film is good-naturedly pleasant. You just don’t see that anymore. Indeed, modern comedies are all about flying bodily fluids, absurd characters, and trying to shock the audience with the level of nastiness in which the characters engage. This is so different. This film wins you over with the exact opposite. This film is about very normal set of people who find themselves in a bizarre situation and yet refuse to abandon their normal sensibilities when trying to figure out how to solve this. Modern comedies, by comparison, are about weirdos imposing their weirdness on the normal world. To me, this is the difference between Shakespeare and an internet novel. 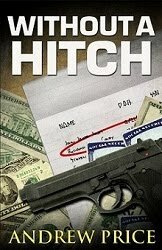 Hitchcock has taken on a truly difficult task and has masterfully given you a story you will enjoy and keep enjoying for years. It is complex, subtle and beautiful. Apatow and Sandler and their types give you shock that wears off often times before the film is even over. All they need to do to write their films is come up with something gross or offensive. What’s more, Hitchcock avoids cynicism. Sure, on the surface it seems cynical, but the story quickly proves itself sentimental and hopeful. That is hard to write without the story becoming saccharine and phony. Hitchcock walks that line. Apatow and Sandler don’t even bother: they traffic in cynicism, which is the ultimate writer’s crutch. Hitchcock also does something else you don’t see anymore: there’s no villain. I’ve mentioned this before, but most of the greatest films of all time actually don’t have a villain to oppose the protagonist. That is something you simply don’t find anymore, however. These days, all films have villains because they are an easy way for bad writers to create conflict. Compare that with this film, where the conflict comes from the consciences of the characters who each think they killed Harry. Could you image an Apatow film being about three characters genuinely struggling with their own consciences? Hardly. If this film were done today, one of them would be trying to frame the others and it would end in a shootout, and that would wipe out everything that makes this film special. Ben Kenobi once described a lightsaber as “not as clumsy or random as a blaster; an elegant weapon for a more civilize age.” That is this film. It is not clumsy or random as the comedies of today, it is an elegant film for a more civilized age. I highly recommend this film. I've only seen this movie once and I found it to be quite pleasant. I'm sure I'll revisit it one day. It's definitely notable for being the first Hitchcock/Herrmann collaboration. And to be fair, I think a movie like this where all the characters try to blame/frame each other could be pretty funny, the moral being something to the effect of, "The dead man lived a more moral life than the living." analingus but I forget which slang term they use! ), and so on and so forth. Scott, I haven't seen the Vacation reboot and don't intend to. It looks awful. And I can imagine that it's exactly what I'm talking about here. That's the problem with modern comedy -- it's all about shocking you about something being inappropriate rather than taking the time to lay the foundation for jokes. Shock can make you laugh, but it's low hanging fruit that wears off very quickly and doesn't really give you anything relate you to the movie. By comparison, it's very very easy to relate to so much in Harry, just like it was very easy to relate to Trading Places or Ghostbusters. What you're pointing to in Trading Places, by the way is exactly what I'm talking about. That story involves people who are generally normal, but who must deal with an unusual situation. The ones who swear a lot are either showing signs of stress or it fits their characters (Murphy) as they try to fit in with the others... fish out of water. In Apatow etc. stories, they are all the fish out of water, but there's no normal world where they need to fit in. Hence, it just becomes a move about of bunch of jerks doing jerky and unrealistic things, and it doesn't connect. "What is the trouble with Harry?" "The trouble is that Harry’s dead." Oh, God. I'm such a nerd! BTW, have you heard of the big event being planned for this summer? On this movie...geez, I really need to catch up on my Hitchcock. Even his subpar films are better than just about anything coughed up today. And this film does sound like an interesting and original concept...wait. 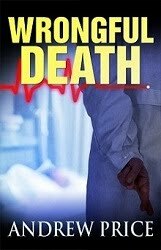 Guy dead, but no knows how he died? Everyone blaming each other? Trying to hide the corpse? Fall? Why are the words "Weekend" and "Bernie" suddenly in my head? Ah, it's probably nothing. Like I said, I haven't seen this one, but it sounds like a good one to see. Andrew, I'll take your advice and wait until fall as it sounds like a seasonal film. Also, I meant to add something to the 'Topaz' discussion, but was busy at the time. When Mike K brought up Mission: Impossible, I remembered a marathon of the show I saw on Decades a few months ago. Apart from having well-defined roles for the characters, the other thing that caught my attention was the use of practical gadgets. Unlike Bond films, where Q seems to use ESP and guess exactly what Bond will face and arm him accordingly, these missions are meticulously planned and every gadget has a place, often leaving you wondering how it will (satisfactorily and logically) fit in. Also, and this is a result of the passage of time, there's the complete lack of typing-on-computer scenes. Look, I understand the role modern computers play today. But still, typing scenes where hackers and experts solve codes that are meaningless to the audience are BORING. The practical gadgets and field work of MI make for more varied and interesting tension. It gets your attention. The teamwork, the planning, and the lack of everything being done on a computer screen are, I think, crucial to the series' continued popularity. In fact, all of those things have been overlooked in spy movies these days. Rustbelt, This one is worth seeing, and I personally like watching it in the fall. It's not his best, but it is a personal favorite of mine. I think they're getting better at the use of computer scenes, though I agree that they are often still boring. My biggest issue is the unbelievability of these scenes. Rustbelt, this is a way off topic and tangential, but your comment on Mission Impossible the tv series, and how the gadgets were always practical and useful, as opposed to Q's ESP, reminded me of an NBC Saturday morning cartoon in the early 70s based on "Around the World in 80 Days." Every episode they would be in a different country and at the start Philias Fogg would tell Paspartou to pack three utterly random items in the bag for the day, and of course they would all come in handy for solving that episode's plot. Need to brush up on my Hitchcock.